Before joining FSFE I have been part of many other political groups or movements. In several of them we spent a lot of time implementing and enforcing basic but strict moderation techniques for meetings. It’s designed for AFK meetings but I’m sure the same kind of things exist for video conference or IRC meetings. Many Free Software projects already use moderation techniques, and several of the tricks described bellow won’t make sense for small meetings like fellowship events. I’m however sure that there are still things any event organiser can pick from the list. When do we need meeting moderation techniques ? A little bit of it is useful in any kind of meeting with, lets say, more than 5 people. It quickly becomes natural. It is especially useful when hot topics are discussed or strong opinionated people are present. The bigger the meeting, the stricter the moderation. Why do we need meeting moderation ? It aims at ensuring that the meeting won’t be hijacked by a little group of people and at easing the active participation of the greatest number of attendants – especially shy ones. It also greatly increases productivity! A main moderator: he or she listens to the group and leads the debates – and must be able to tell anyone to shut up if needed. Having a precise agenda ready before the meeting is a good idea. In there should be the topics that will be discussed, and how long the discussion on each one should roughly be. Who controls the agenda has a lot of power over the meeting. The agenda must therefore at least be publicly available and participants should ideally be able to modify it / be part of its redaction beforehand. Keep a speakers list with two columns if you want to ensure equal participation of two groups of people (with one usually louder than the other) : male / female, new members / people who have been there for ever, tech / non-tech… Then pick the first name of each column alternatively to announce the next speaker. Fix a maximum time for each intervention (two minutes ?) and prepare sheets of paper with ’30s’ on it to tell the speaker that he/she only has 30 seconds left, and then in red ‘-30s’ or ‘-1min” when the time is over and he/she still doesn’t stop. There, the ability of the main moderator to really make people shut up becomes useful. Keep in mind of how long the whole discussion on a topic should be – and what should be it’s outcome (vote? Concrete proposals?). With this data, the moderator or list-and-time-keeper can announce when will the speakers list for a particular topic be closed (like “time for 3 more speakers to register, then we close the list for this round”). Note : for this kind or rules to work they must be clearly stated, explained and agreed at the beginning of the meeting. -> Agreement : this gesture is supposed the replace “that’s a good idea” / “cool” / “I agree” / “Yeah I wanted to say that too!”. -> Repetition : this gesture needs to be used with care and requires the moderator’s vigilance. It can hurt and discourage some speakers (strangely, experience shows that it does it more than the “disagreement gesture”). To replace “you are repeating what a countless number of speakers have already say” / “go on ! It’s too slow !”. It of course doesn’t need to be done so high, I usually do it at chest level. Other gesture can be added, especially for international meetings, like for example to express the need for translation of a particular point. This post could go on forever, but what is important is just that we should put some time into the creation of formal or informal rules to make our meetings nicer, less hostile for newcomers and shy people, more democratic and in general… more useful and productive. Experiment, make up your own techniques and share it! 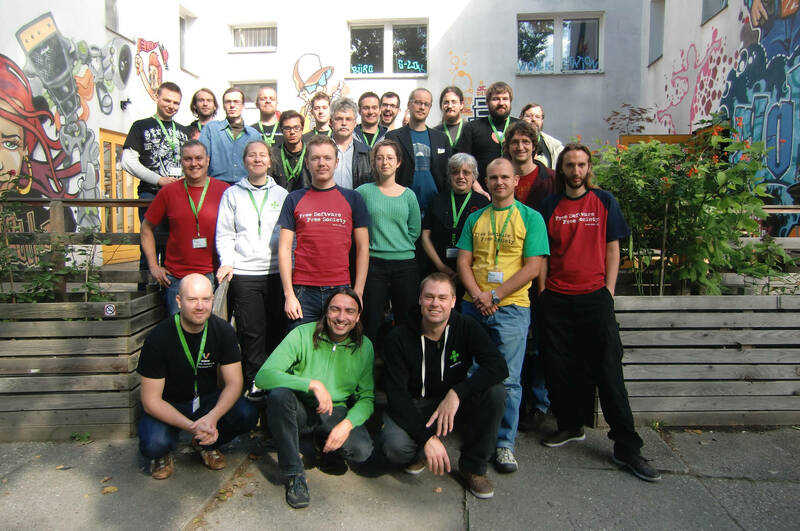 In order to promote Free Software even more efficiently and increase the reach of FSFE’s work across Europe, 22 Fellows from FSFE, coming from 10 countries, gathered on September 28-29 in Berlin for the first European Coordinators Meeting. During the week-end, team, country and group coordinators learned to know each other, exchanged views and good local practices, provided valuable feedback about FSFE’s campaigns and presented their numerous projects. Each coordinator brought his or her expertise and made it benefit everyone else. Presentations covered a comprehensive range of issues important for the Fellowship. It included advocacy material and strategies; ideas and advise to organise successful events, to build, coordinate and make solid local communities grow; tools for communication and outreach; campaigns and workshops. All the presentations generated lively and valuable discussions. Feedback about the first coordinators meeting were excellent, I’m looking forward to the next one!